Thanks, Roy, aka Fadedred, for your super pictures and input. Roy has paddled this baby for years and has provided outstanding input for paddlers of all experience levels on paddling.net. Notice that Roy has the four nut-bolt Valley with black rubber washers to prevent water ingress. Also note that his three-piecer has flat bulkheads, i.e. the contact area is flat. Now--for better or for worse--the Valley's have a tab of flange with male-female interaction at the abutting surfaces. I will post photos of the Valley four nut and bolt system specifically. 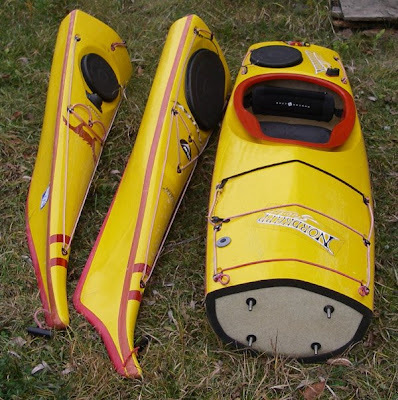 Upcoming on this blog are weights of each section of my Aquanuat and Aquanuat LV boats, photos of the adjoining members and the four bolt-system, and an occasional tip about sectional kayaks. 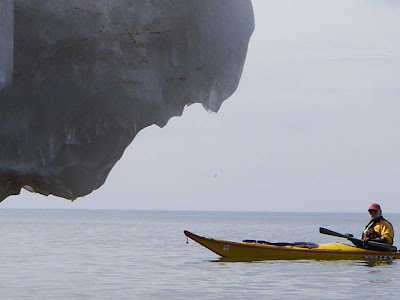 I will also link Marcus Demuth's website, which always googles to the top on the web for sectional kayaks. I would like to find someone with clips for joining the sections for some close-up photos and comments about that mechanism. How heavy is this 3-piece? Looks heavy with the foot pump installed ...?